The second company to recall millions of eggs gets hens and feed from the first company, which has been fined millions of dollars for health violations and is owned by a man who has been "involved in legal cases that have forced him to settle with the federal government for hiring illegal immigrants, for tolerating sexual harassment at his company, and has faced a litany of animal cruelty charges," Emily Friedman of ABC News reports. We've previously reported on the decline of rural groceries, and one advocate says the decline has become a full-blown crisis. "These businesses are closing at an alarming rate," David Proctor, director of the Center for Engagement and Community Development at Kansas State University, writes for the Daily Yonder. "Almost daily another small-town, independently-owned store shuts its doors and closes up shop." In Iowa nearly 43 percent of groceries in towns smaller than 1,000 people have closed, and Kansas has lost nearly one in five rural groceries since 2006. "Rural grocery stores are part of the economic engine that sustains rural communities," Proctor writes. "They are a significant source of local taxes, powering the creation and maintenance of civic services and amenities. They provide essential, stable jobs – butchers, cashiers, managers, and stockers – at a time when we are desperate for employment opportunities." Proctor explains that his research has shown many rural areas lacking full-scale groceries are "facing a crisis of access to healthy foods" such as fresh produce. The million gallons of oil spilled into Michigan watersheds, including the Kalamazoo River, from a Enbridge Energy Partners pipeline last month, showed how dangerous oil pipelines spills can be, and such spills might be more common than you think. Environmental Protection Agency data shows "tens of thousands of miles of oil and gas pipelines crisscross the U.S., and they spilled more than 2 million gallons of oil in 2009 alone," the Society of Environmental Journalists reports. These pipelines tend to run through rural areas, making SEJ's tipsheet for covering pipeline threats of particular value to rural journalists. "For the Enbridge spill in Michigan, there was extensive evidence of looming problems," SEJ reports, adding that finding evidence that there were problems before a spill is difficult, but key in coverage of such events. The Associated Press reported shortly after the spill that the Pipeline and Hazardous Materials Safety Administration met with Enbridge officials in February regarding problems with corrosion monitoring and other issues in this pipeline. Since May the U.S. House Subcommittee on Railroads, Pipelines, and Hazardous Materials has held four hearings about pipeline risks. Minutes from each of those hearings (May 20, June 29, July 15 and July 21) can provide valuable information for journalists. Rural and urban perspectives often differ. One such area is pets, and research confirms what some of us have thought for a long time, that "People who regard pets as children tend to have a city background, for example, while those in rural areas have a more practical attitude," Robert Preidt of HealthDay reports for USA Today. The research at Indiana University South Bend was presented Sunday in Atlanta at the American Sociological Association's annual meeting. On the surface Russia's ban on grain exports in the face of a devastating drought may seem like good news for U.S. farmers as wheat prices skyrocket, but lessons from the recession have left some wary. "As planting time approaches next month, they are balancing the possibility of greater income against the failed promises of the past, when bonanzas turned bust, sometimes at terrible cost," Kirk Johnson of The New York Times reports. "Even many who plan to plant more wheat are begrudging and hesitant — fearful that global dynamics could shift again before next year’s harvest." Wheat prices heat a two-year high recently, up 57 percent from less than three months ago. "The market says plant more," Eugene Schroder, who farms about 4,000 acres in southeast Colorado, told Johnson. Still Schroder said he "feared that wheat prices were being driven by speculators, as was the case a few years ago, just before the recession, when the price soared and then crashed," Johnson writes. Schroder explained, "What is this wheat market? I don’t have a clue, and I’m a professional wheat farmer. There’s a complete lack of transparency." If good weather holds up over the next few weeks, Schroder plans to quadruple the number of acres for wheat. Even before the Russian ban, U.S. wheat planting expectations were higher than last year. Now "a quirk of crop insurance, which locks in grain prices for policies based on a window that was set in the last few weeks — after Russia announced the ban on grain exports on Aug. 5 — could accelerate the trend, farm experts said, or prompt farmers in other parts of the country to give wheat another look," Johnson writes. Even with those factors, a wheat boom may not be in the offing. Last year fewer acres of wheat were planted nationally than any year since 1971. In April President Obama established the America's Great Outdoors Initiative "to develop a conservation agenda worthy of the 21st Century and to reconnect Americans with our great outdoors." Now the Obama administration has launched a listening tour in which cabinet officials will gather feedback across the country about strategies to reconnect Americans with the outdoors. The tour has already stopped in 13 cities, with five more scheduled and more stops expected. You can find information about the five upcoming tour stops below or visit the initiative's website here. 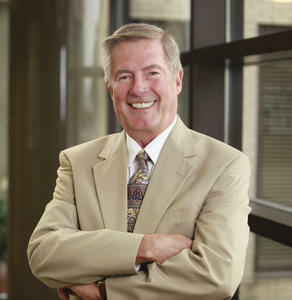 "Wally was a remarkable newspaperman and a great friend," said Jon Rust, co-president of the company. "He will be greatly missed. We've been hearing from people from Seattle to Maine about his death. He touched the lives of many people." Lage is survived by his wife Dori, four children and seven grandchildren. (Read more) Funeral arrangements are incomplete. UPDATE, Aug. 21: Sherrod will meet with Agriculture Secretary Tom Vilsack Tuesday to discuss a job offer, CNN reports. Shirley Sherrod, the former Department of Agriculture Rural Development director in Georgia who delivered a message to an NAACP banquet and ended up the subject of a heavily edited video by blogger Andrew Breitbart, writes for the NAACP blog about her experience and her conversation with NAACP President Benjamin Jealous: "As he has done in public, Ben movingly apologized for the fact that the NAACP was initially hoodwinked by Breitbart and Fox into supporting my removal. I told him what I want to tell you. That's behind us, and the last thing I want to see happen is for my situation to weaken support for the NAACP. Too many people confronted by racism and poverty count on the NAACP to be there for them, especially those in rural areas who often have nowhere else to turn." While a teenager, Sherrod's father was murdered in Baker County, Georgia (pop. 3,637). The crime was witnessed by three people, but a grand jury did not indict the white suspect. Sherrod vowed to stay in Georgia and fight racism. Said Sherrod: "I didn't yield when, just months after my father was killed, they came in the middle of the night to burn a cross in front of our house with my mother, four sisters, and the baby brother my father never got to see still inside. And I'm surely not going to yield because some Tea Party agitator sat at his computer and turned everything I said upside down and inside out. " The Associated Press and the Sunlight Foundation, which was created to improve government transparency, are sponsoring a series of webinars to help reporters deal with the new rules governing campaign finance in this year's elections. The last one will be held from 4 to 5 p.m. EDT Thursday, Aug. 18. To register, click here. Some interest groups are already running ads, and the National Republican Congressional Committee has released a list of districts in which it will advertise. Many are represented by rural Democrats. The outside spending will also occur in state legislative races where control of chambers is at stake, as Tom Humphrey of the Knoxville News Sentinel reports. And don't forget Internet ads, which the Natural Resources Defense Council is coupling with radio in an effort to get six moderate senators to support a bill on climate change. UPDATE, Aug. 20: FactCheck.org finds fault with outside groups' ads on both sides in the California governor's race. Advertising purchases of more than $10,000 that name a federal candidate, and the names of contributors of $1,000 or more toward the effort, must be reported to the Federal Election Commission within 24 hours. Independent expenditures, which advocate election or defeat, must be reported to the FEC within 48 hours (or 24 hours close to the election). See http://www.fec.gov/. Another source of information about all campaigns buying broadcast ads is the political public-inspection file at stations and cable-TV companies. Developing relationships with people at these outlets may enable you to get the information over the telephone without having to go to the station. Other topics covered in the webinar include: changes wrought by the Supreme Court decision; where to find campaign-finance data, including some sites we had not heard of; how money is raised, and what that says about a campaign; why spending is also important to track; and the relationship of lobbying to campaigns. As Sharon Theimer of AP said, this is not just a document-driven beat, but a source-driven beat. This writer has decades of experience covering political campaigns and is available to help rural journalists; just e-mail al.cross@uky.edu. In rural and community journalism, sometimes the best editorials are those that make a point by using the personal experience of the writer, who is usually known to most of the community. A good example of that was last week's editorial (presented as a column, as rural editors often do) by Ryan Craig of the Todd County Standard, for several years judged Kentucky's best small newspaper. "The lawsuit comes against the backdrop of an argument by some Eastern Kentucky residents that four decades of mining activity, including clearing areas of native forests and compacting the ground during reclamation, have worsened flash flooding," Estep writes. 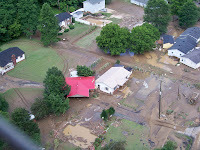 Coal companies counter no scientific link exists between surface mining and flash flooding, and they work to limit effects of mine sites by reclaiming them responsibly. Tom FitzGerald, executive director of the Kentucky Resources Council, disagreed with those claims, saying "studies have long linked surface-mining activities to a higher incidence of flash flooding," Estep writes. Much focus has been placed on poor oral health, particularly among low income children, since the move for health care reform began, and now some areas are increasingly looking to resources outside of dentist offices to address the problem. The Maine-Dartmouth Family Medicine Residency has added dental clinics to its patient care regimen, and in "Storm Lake, Iowa, school and home health nurses are giving oral exams and fluoride treatments to children as part of a broader-based program known as Early Smiles," Candi Helseth reports for the Rural Monitor Newsletter. A 2008 issue brief from the Center for Studying Health System Change listed "low rates of dental insurance coverage, limited dental benefits available through public insurance programs and a lack of dentists willing to serve low-income patients" as key barriers to dental services. MDFMR faculty member Dr. William Alto began the group's oral health program in 2003 after becoming frustrated by the lack of oral care he saw among his regular patients. "In the last six years, we’ve seen more than 2,300 patients for oral health needs," Alto told Helseth. "Our residents have found cancers, lesions and other oral health problems that need medical care. We encourage our residents to do an oral exam with every medical exam." The emerging sustainable economy enterprises in the region "vary in scale and stage of development, but, in general, they are more ecologically sustainable because of the way they are produced and the greatly reduced transport distances to market," Flaccavento writes. "They use asset-based strategies, building and adding value to the ecological, cultural, and human strengths of the region. They cultivate self-reliance for producers and the broader community. And they build cooperative networks that help overcome isolation, estrangement, and problems of scale." He points to three areas (food and farming, forestry and green building) as fields where sustainable economic endeavors are catching on in Appalachia. "By 2009, there were more than 20 local healthy-food initiatives in the region, encompassing a range of crops, products, and business models," Flaccavento writes. For instance, the Appalachian Community Economic Network’s commercial kitchen initiative, launched in 1994, has helped launch or expand 250 food businesses that have generated over $6.5 million in annual sales. Flaccavento points to the Forest Opportunities Initiative, launched in 2008 by the Mountain Association for Community Economic Development, as an example of sustainable economic development in the forestry industry. You can read previous Rural Blog coverage of that program here. Green building initiatives, which arose in the region out of affordable housing efforts, emphasize "energy conservation and efficiency, along with the use of regional, sustainably produced wood and other materials and renewable energy sources such as geothermal, solar, and wind," Flaccavento writes. As central Appalachian economies work through a time of transition, Flaccavento offers six principles of sustainable economies they should follow. Sustainable economies are locally rooted, fit within the ecosystem, are more self reliant and resilient, are more just, have infrastructure that increases the value and marketability of their products and are engaging and empowering, Flaccavento writes. He suggests economic strategies should be examined through the lens of two questions: To what degree does our strategy, policy, technology, or enterprise sustain or restore the ecosystem’s capacity to sequester carbon? and How effectively do our strategies and policies accelerate the development of diverse, resilient, wealth-building local economies?. The United States has long had trouble living up to the promise in the Declaration of Independence that "all men are created equal," but today's inequalities have more to do with prosperity than race, gender or religion, a leading rural health advocate writes. "Our health seems to depend not only on how much we have, but also on how much those around us have," Wayne Myers, founder of the University of Kentucky Center for Excellence in Rural Health, writes for the Rural Monitor Newsletter. "No one knows how economic inequality shortens life, but it does. Clearly it is more dangerous to be poor in a rich country than to be poor in a poor country." Myers points to the "Gini Coefficient," a formula developed in the 1800s to measure "the inequality of distribution of most anything within a population." Myers argues the change in the coefficient between 1979 and 1999 in urban versus rural areas shows "the rich urbanites got really rich while the poor urban and city people stayed poor." He explains, "The reason for this growth in disparity is that almost all of the growth in America’s economy in recent years has been in the high-income sectors, and these are generally in urban populations." Ninety-four companies, groups, universities and other entities in 37 states won broadband investment money today from the federal economic stimulus package. The awards announced today total $1.8 billion, perhaps the largest single group announced at one time, and went mostly to rural areas. The next largest award went to Hughes Network Systems, $58,777,306 for a national project. In Kentucky, two awards were given to Windstream Corp., totaling $58,762,826, which would make it the 12th largest award. Altogether, Windstream (formerly Alltel) was awarded over $64 million. Windstream "has won funding for 12 out of 30 projects for which it requested funding," Joan Engebretson of Connected Planet reports. An old tradition may be turning into a more common solution for the rural shortage of obstetrical services: midwifery. Data from the American College of Nurse-Midwives shows "The number of family medicine physicians and ob/gyns delivering babies in rural areas continues to decline, but nationwide, from 1996 to 2006 when the most recent data was collected, the number of births attended by certified midwives increased by 33 percent, reaching a record high of 317,168 in 2006," Candi Helseth reports for the Rural Monitor Newsletter. The original midwifery model focused on rural outreach when Frontier Nursing Service founder Mary Breckinridge opened the first American midwifery school in Eastern Kentucky's Leslie County in 1925. Today, the Frontier School of Midwifery and Family Nursing, an outgrowth of the original FNS, still has a rural focus, "with its operation of a college that offers graduate level nursing-related degrees and a rural health service that includes five clinics, home health, and a 25-bed critical access hospital where CNMs deliver babies," Helseth writes. While midwifery is most commonly associated with birthing, the midwife model of care focuses heavily on prevention and education, Helseth reports. 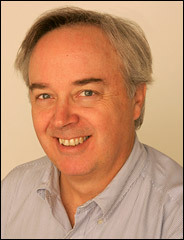 Before large newspapers cut much of their rural coverage and circulation, columns like Charles Salter's "Georgia Rambler" in the 1970s Atlanta Journal were more common. Salter visited a different rural Georgia town for each column and asked locals, "Who is the most interesting person you know?" For a late July episode of the wonderful radio show "This American Life" from Chicago Public Media, producers set out to duplicate Salter's idea, sending seven reporters to eight Georgia counties to ask the same question. Ira Glass, the host of the show, said they got too many stories to tell on the one-hour program, so they selected the seven best. Among the highlights was a local debate in Meriwether County as to whether President Franklin Delano Roosevelt was a fan of the local moonshine near his Warm Springs home during Prohibition and the "Soundoff" column in the Summerville News of Chatooga County, which suggests locals are supremely concerned with Krystal hamburgers. For the show's final segment, Salter's son Chuck, now a senior writer at Fast Company magazine, revisits the subject of one of his father's more memorable columns 33 years later to examine what effect the construction of a lake he was fighting ended up having on his farm. You can stream the entire "Georgia Rambler" episode on This American Life's website here or access the show's complete radio archives for its weekly themed podcasts detailing stories from around the country. An essay on the website Minding the Campus, by Russell K. Nieli, explores the question of diversity among students at highly selective universities. Nieli posits that elite schools consider diversity only when it includes racial diversity, which unfairly excludes "numbers of born-again Christians from the Bible belt, students from Appalachia and other rural and small-town areas, people who have served in the U.S. military, those who have grown up on farms or ranches, Mormons, Pentecostals, Jehovah's Witnesses, lower-middle-class Catholics, working class 'white ethnics,' social and political conservatives, wheelchair users, married students, married students with children, or older students first starting out in college after raising children or spending several years in the workforce." Nieli primarily bases his commentary on a book by Thomas J. Espenshade and Alexandria Walton Radford, No Longer Separate, Not Yet Equal: Race and Class in Elite College Admission and Campus Life. They found that participation in high school ROTC, 4-H clubs, or the Future Farmers of America (now simply the FFA, and not limited to future farmers) was "found to reduce very substantially a student's chances of gaining admission to the competitive private colleges," Nieli writes. "The admissions disadvantage was greatest for those in leadership positions in these activities or those winning honors and awards." Espenshade and Radford say excelling in these activities is associated with 60 or 65 percent lower chance of admission. Their conclusion: It not only does not help kids, it hurts them, to be leaders in the groups often found in rural high schools. 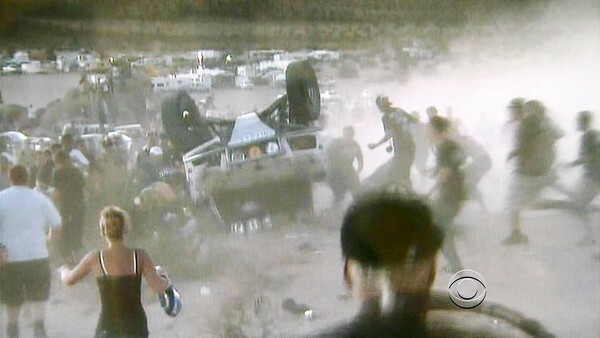 A desert off-road race from Las Vegas to Reno, Calif., is still scheduled for Friday even as federal officials reviews their safety policies for such races after eight spectators were killed a similar event in Southern California Saturday. "Officials with the Bureau of Land Management, which permits more than 100 off-road races a year on desert land it oversees, said they are confident that adequate safeguards are in place for the Nevada race," Phil Wilson of the Los Angeles Times reports. "But critics of the agency called the decision reckless, saying the bureau lacks the manpower and desire to ensure the events are safe." Amid increasing budget pressures from the recession, Georgia is among a handful of states looking to corporate sponsorship to help fund state parks. "According to preliminary survey results from the National Association of State Park Directors, a growing number of states are trying out or considering corporate sponsorship or exclusive distribution deals as a way to help close budget gaps," Melissa Maynard of Stateline.org reports. "State parks have traditionally resisted any type of commercialization, says Phillip McKnelly, the association’s executive director, and the interest in pursuing corporate partnerships is a relatively new phenomenon driven by the severity of funding crises in state park systems." In Georgia Verizon Wireless will sponsor the annual Boy Scouts volunteering in state parks by providing "funding for tools and supplies as the scouts perform service projects around the state," Maynard writes. In exchange, the park service will recognize Verizon in publicity materials and on the Georgia Department of Natural Resources website. "Every interstate has these huge brown signs that tell you ‘Red Top Mountain State Park,’" department Commissioner Chris Clark told Maynard. "And at the bottom, we'd love to have 'Chick Fil-A,' or whatever else, as a simple way of marketing." The controversy over building a huge Islamic community center and mosque two blocks from the site of the World Trade Center, exacerbated by President Obama's remarks on the subject, has exposed a serious lack of knowledge among many Americans about Islam. Contrary to suggestions that the main imam behind the project might have links to Islamic radicals, he is a leader of the Sufi sect, "which in terms of goals and outlook couldn’t be farther from the violent Wahhabism of the jihadists," author William Dalrymple writes for The New York Times from New Delhi. Dalrymple sees in the U.S. "a dangerously inadequate understanding of the many divisions, complexities and nuances within the Islamic world — a failure that hugely hampers Western efforts to fight violent Islamic extremism and to reconcile Americans with peaceful adherents of the world’s second-largest religion. Most of us are perfectly capable of making distinctions within the Christian world. The fact that someone is a Boston Roman Catholic doesn’t mean he’s in league with Irish Republican Army bomb makers, just as not all Orthodox Christians have ties to Serbian war criminals or Southern Baptists to the murderers of abortion doctors." Vilsack, the former Iowa governor, said he thinks the estate tax will be restored. The key is having appropriate exemptions for people who want to pass their farm down to a family member or someone else, he said. He expects to see a large enough exemption to cover the “vast majority” of farms and ranches in the country, he said. At the same time, however, he said there’s a need for the 2012 farm bill to focus on improving opportunities for young farmers. Many have wondered what it will take to reverse the decline of small, independent livestock producers, but according to some advocates the answer to that question is just two cents more per pound for meat at retail. 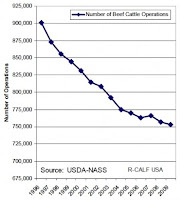 "Adding two cents on every pound in the meat counter would keep ranchers from losing money and turn slaughterhouse jobs from work into a living," Bill Bishop of the Daily Yonder reports. 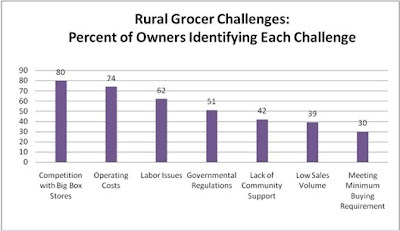 "Two cents a pound at the grocery would fundamentally change the economies of thousands of rural communities." The second penny in the formula would go to workers at meatpacking plants. Despite rising food prices, Lauritsen told Bishop, meatpacking plants are under pressure to cut hourly wages. If one cent per pound of retail beef went directly to workers' wages, Lauritsen said average wages could go from $13 per hour to $16. "I will tell you, brothers and sisters, that that would make a dramatic change in a person's lifestyle," he told the convention. "It would change the main street Cherokee, Iowa. It's life changing money and it's only a penny." The fact that different crops receive different amounts of federal support in the form of crop subsidies isn't a secret, but a new report hoping to quantify those differences shines new light on the regional influences affecting farm policy. The report, from the Congressional Research Service, shows "cotton and rice, two crops grown primarily in the South and in California, have the most generous support levels, while barley and soybean growers have the least. Wheat, corn, sorghum and oats fall in the middle," Philip Brasher of the Des Moines Register reports on the Green Fields blog. "The study calculated the amount that loan rates – a basic price guarantee level – would have to be changed to equalize the commodities and found that the rate for soybeans would have to be raised by 7 percent, while the rate for rice would have to be cut by 33 percent. The corn would need to be increased by just 3 percent," Brasher writes. The study reports subsidies account for more than 30 percent of the total production cost of rice and cotton compared to 12 percent of corn and 3.6 percent of soybeans. The study reports rice farmers received $217 per acre, compared to the $40 per acre average for all crops. Soybean farmers received $9 per acre while corn farmers received $50 per acre. While railroad companies may transport hazardous materials through thousands U.S. communities every day, those communities are not entitled to know what materials may be on the train. Federal Railroad Administration spokesman Warren Flatau said only the railroads are required to know what is in the cars they are shipping, which means local emergency workers, "who would respond to a leak, spill or fire, have no knowledge of what's being transported on those cars until an accident happens," Julia Hunter of Gannett News Service reports. Railroad authorities say keeping the contents of trains secret is a matter of national security. "Advocates for the public argue the rail cars are clearly marked, and if terrorists wanted to find a car full of hazardous material, they easily could," Hunter writes. Fred Millar, a Washington-based consultant on hazardous-material transportation issues and national security, said, "They think that having the public know about the shipments of these cargoes is somehow a security breach. That is absolutely ridiculous. ... These are gigantic tank cars with placards on the side going to and from the same places. The only people being kept in the dark are the American public." 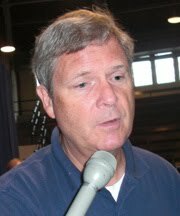 Agriculture Secretary Tom Vilsack is back home in Iowa today, visiting the state fair as part of the Obama administration's dispatch of cabinet-level officials to fairs across the country. He got a great sendoff Sunday, in a column by political bigfoot David Broder of The Washington Post. "Over the years, reporters learn that here are a relative handful of the public officials with whom we deal who can be counted on to expand our understanding of events. These are the men and women who have probed deeply into the forces shaping the country -- or their part of it -- and often anticipate the challenges still to come, Broder wrote, saying Vilsack "planted useful thoughts every time I interviewed him. So I was surprised when Vilsack was cast as the fall guy in the ugly incident last month involving the forced resignation of an African American government employee who was accused by a blogger of reverse discrimination against a white farmer." So Broder chatted with Vilsack to find out what else he had been doing as secretary, and learned that "his chief concern ... is the condition of rural America," which has bad trends that started long before the recession: "an aging, less educated and declining population with an average annual income $11,000 below that of their urban neighbors -- are not because farmers are hurting. Indeed, farm income is up 9 percent over last year, and farm exports are at nearly record levels. But most of those living in rural America are not farmers. And so the formula for boosting those counties includes an emphasis on exploiting their energy resources, creating local food markets for local products, expanding broadband and promoting outdoor recreation." Here is Vilsack's White House Blog post on his visit. Other upcoming state-fair visits announced so far: Small Business Administration Deputy Administrator Marie Johns in Indiana Aug. 18, and Transportation Secretary Ray LaHood in Illinois Aug. 20. The unemployment rate for rural America in June was lower than in June of 2009, making it the first month so far in 2010 with a lower rate than the previous year. 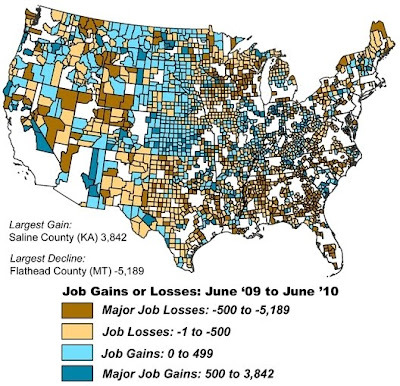 The June 2010 unemployment rate for the country's 2,038 rural counties was 9.5 percent, down from 9.9 percent in June 2009. However, only 772 rural counties,. 38 percent of the total, actually added jobs in the last year, Bill Bishop and Roberto Gallardo report in the Daily Yonder. An Associated Press review of Department of Energy records found that 30 traditional coal-fired power plants have been built since 2008 or are currently under construction. The dozens of new old-style coal plants "will cement the industry's standing as the largest industrial source of climate-changing gases for years to come," Matthew Brown reports for AP. "The construction wave stretches from Arizona to Illinois and South Carolina to Washington, and comes despite growing public wariness over the high environmental and social costs of fossil fuels." The expansion marks the industry's larges in two decades and "represents an acknowledgment that highly touted "clean coal" technology is still a long ways from becoming a reality," Brown writes. Severin Borenstein, director of the Energy Institute at the University of California-Berkeley, explained, "Building a coal-fired power plant today is betting that we are not going to put a serious financial cost on emitting carbon dioxide. That may be true, but unless most of the scientists are way off the mark, that's pretty bad public policy." "Every opportunity in rural America is predicated upon smaller farms, more people on the land farming," farmer and New York Times editorial board member Verlyn Klinkenborg told Brian Mann of upstate's North Country Public Radio over the weekend. Klinkenborg, who grew up in rural Iowa, said much of rural America needs "more people to form a society; there is no society in so much of rural America." He said farming in 600- to 1,000-acre tracts is useful for commodity farming and raising corn for ethanol, "but it doesn't make sense for actual food and it's not the best practice for the soil." Klinkenborg writes an occasional, short column called "The Rural Life," usually drawn from his five-acre farm in New York's Columbia County, but he told Mann that he's "clearly not a farmer in any real sense. ... The real point is to be engaged in the life and death cycle of a farm, to be engaged in growing your own." He said the most important part of his rural life is living with animals. "Most Americans have given up that experience," he said. "It's a shame, because living with animals teaches you a huge amount about the boundaries of being human." Two Internet companies are hoping to launch new satellites in the next year that will increase broadband speeds for underserved rural areas at a cheaper cost than wired alternatives. Satellite Internet providers "serve a little more than one million customers, most in rural areas that have no other options. Their services can be painfully slow and cost twice as much as high-speed broadband," Susanna G. Kim reports for The New York Times. Now WildBlue and HughesNet hope to change satellite Internet's reputation with state-of-the art services. WildBlue’s new satellite "alone will have 10 times the capacity of its three current satellites combined," Kim writes. The companies say the new satellites "will enable them, at prices similar to what they now charge, to provide Internet service at speeds many times faster than they now offer — as fast, in some cases, as fiber connections," Kim writes. Arunas Slekys, vice president for HughesNet, told her, "One advantage satellite has is ubiquity. The cost of reaching you with a satellite dish is independent of where you are. Fiber or cable is labor-intensive and dependent on distance." "There’s an unserved market" in rural areas, Slekys said. "And it’s not as though they have terrestrial or satellite. They only have satellite as a choice." Even with the improved equipment, users will face slight delays, about a half-second, as signals are transmitted the 22,000 miles from satellite to their personal computer, Kim reports. Customers who aren't able to point their dishes toward the satellite's locations in the southern skies won't be able to access the improved speeds, and dishes must be cleared of all snow during winter. 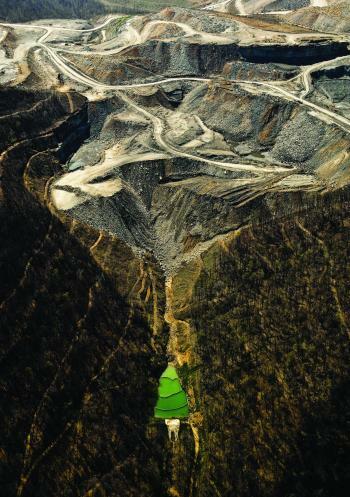 The West Virginia Department of Environmental Protection issued new water-quality guidelines late last week that the agency hoped would circumvent tougher rules that the U.S. Environmental Protection Agency proposed to would curb mountaintop-removal coal mining. "Under the new policy, the DEP would require more detailed toxicity testing downstream from mining operations and for the first time force mine operators to show that proposed mines would not have a 'reasonable potential' to cause 'significant adverse impacts' on aquatic ecosystems," Ken Ward Jr. of The Charleston Gazette reports. "The state's policy, though, would largely base such decisions on methods that EPA scientists believe are not the most sophisticated available and without using a firm limit on electrical conductivity as a measure of stream health." Aug. 30 -- Hyatt Regency Crystal City -- Arlington, Va.
Sept. 2 -- Grand Hyatt -- Denver, Colo.
Sept. 14 -- Holiday Inn Charlotte (Airport) -- Charlotte, N.C.
Sept. 16 -- Hilton Chicago -- Chicago, Ill.
Sept. 21 -- Omni Hotel -- Pittsburgh, Penn. Sept. 28 -- Seelbach Hilton -- Louisville, Ky.